Phil Rosetti, an assistant varsity football coach, an assistant varsity girls basketball coach, a Windham High School teacher for the past 19 years, will be exiting the high school doors for new adventures. Known by most as Coach Rosetti or ROSI has accepted the assistant principal position at South Portland High. Coach Rosetti has coached football for the past 15 seasons, 12 of those seasons with Coach Matt Perkins. He started in 1999 with the very first varsity football team in Windham. Coach Perkins was hired for the fourth season. After Coach Perkins’ first season in 2002, Rosetti joined his staff and hasn’t regretted one moment of that decision. Primarily Rosetti worked with the linemen on both sides, but was there for all the players. The players looked at Coach Rosetti as Coach Perkins’ right hand man. He is respected by the students he has influenced both on and off the field. Football holds a lot of fond memories for Coach Rosetti. As a coach for so many seasons in a sport that derives so much passion from the players, from the coaches, from the fans, Rosetti believes that he has been a part of some tremendous things. From comeback wins, to last second heroics, and to state championship games, he has witnessed a program grow from its beginning to its current status of being one of the top programs in the state. Rosetti is proud to say, “I’ve had a small role in making it happen.” To those who have had the pleasure of working with Rosetti they would concur. “Probably one of my fondest moments occurred the first year we had football at Windham,” Rosetti started. “In the old school there was a big trophy case by the main office that students hung out near before school. On the Friday before our first game we issued game jerseys for the players to wear to school for the day. As I entered the building I saw some of the football players gathered by the main office. I watched these players interacting with each other joking around. These teammates were students who previously wouldn’t have spent a second getting to know each other. It was the star basketball players, the vocational students, the farmers, along with students in the National Honor Society and members of the chamber singers; it was at that moment that I realized the impact football would have on our community and the culture and climate of our schools.” Rosetti believes that athletics was the avenue to bring people together and that it is more than just a game. Exiting senior Matt Roy has nothing but good things to say about Coach Rosetti. "He was well respected and liked by everyone on the team, no matter the grade or position of the player. Coach always put the players first and was there when needed." Roy continued, "Coach Rosetti was always in a good mood and made practice fun with his jokes and positive attitude." A lot of things that go on behind the scenes of any sport fans are not aware of. Those take a lot of dedication from coaches which Rosetti made happen for Windham's football program. Coach Rosetti ran the weight room at 5:00 a.m. and helped with the speed and agility training in the afternoons as well as taking on additional tasks such as taking care of the football equipment logs. "Coach will be a great loss not only in these areas of the football program but he will be a big loss to the tradition and heart of Windham football," said Roy. “There are a lot of great memories that I take with me from both sports. In basketball it would be the great rally and comeback win versus Falmouth in this year’s preliminary game. The resolve, never say die attitude, and work ethic displayed by the Lady Eagles was tremendous and a true character of all Windham teams,” he said. In coming senior Sadie Nelson was saddened by the news of Coach Rosetti departure, but at the same time very excited for him. The season wasn't the driest or the warmest this year, but the dedication of a baseball player is hard to top. Windham Little League teams consist of 9- to 12-year-old boys that work together during the season, learning to work together while they say goodbye to past members and welcoming incoming members all while forming a bond to keep them strong on and off the field. The championship game was played at Ciccarone Field at Lowell Farm on June 17th. Zwirner State Farm faced off against C.R. Tandberg. The game went eight innings, which is two extra innings for a little league game. A well matched game on both sides kept the score close. State Farm pulled ahead in overtime to end the game. Both teams played the season with dedication to the sport, the love of the game and the enthusiasm of a boy wanting to do his best. With only losing one game all season the Zwirner State Farm team went on to become the 2015 Windham Major Little League Champions 7-5. Bottom Row L to R: Logan Marden, Tate Chork, Colby Raynor, Harrison Boyle, Ethan Barker, Haddon Boyle. Summer has finally hit us. A time when school is out and the kids and sport coaches can enjoy some down time, or so we like to believe. Behind the scenes of the regular sports season, kids and coaches continue to strive to improve themselves and their teams while volunteering and participating in sporting camps. One such camp is girls basketball. 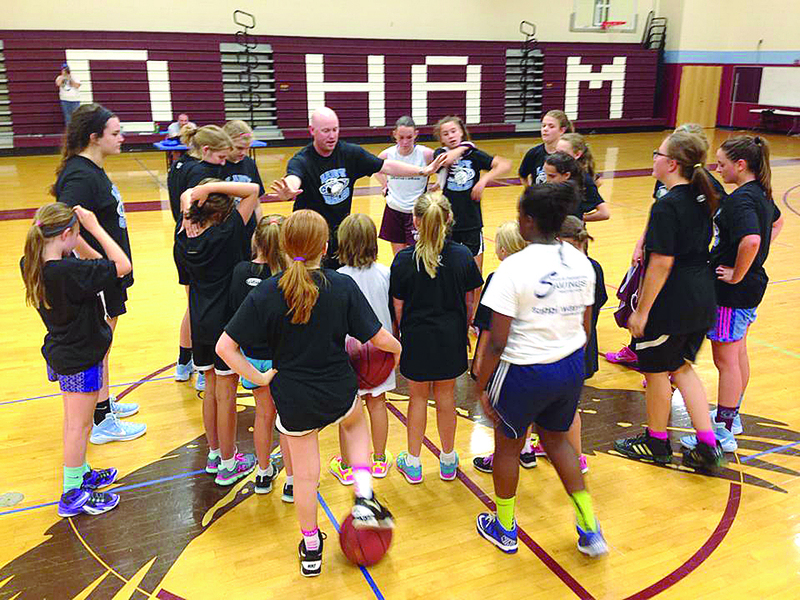 Varsity girls basketball coach Brody Artes hosts a week long summer camp where he recruits incoming third through eighth grade girls to spend time honing their skills. Adding a unique twist to this camp is that coach Artes has his current varsity squad members volunteer their time and talents to help. Though the girls will acquire community service hours for doing so, it is all about volunteering their time to kids that look up to them. Incoming senior Sadie Nelson who has been volunteering her time each summer since her freshman year said, "I personally love working with the kids, I love being there and I wish I could've been there more each summer." However, due to Sadie's other commitments time doesn't allow it. Speaking with Sadie you can tell she feels that she is making a difference with the kids. Sadie will be closing in on her thousand point record this season. "I want to be a role model to them and I think it's good for the team and them to bond together and have them get to know us. I think the younger girls look up to all of us and I love being a part of everything. I love going to their games and practices it's my favorite thing!" The girls practice basketball fundamentals, learn to play as a team, and see how the older girls volunteer their time. They enjoy getting to know the varsity team, which also helps awareness of the sport itself in the school season. More fans are coming to see the girls basketball team play. This camp is an inspiring camp all around for the girls and has created role models for the girls coming in behind them. This camp and these girls are also the last group to play on the current high school gym floor as remodeling begins for a new gym. Senior Lake Region track star Kate Hall made history at the New Balance Nationals outdoor track and field championships in Greensboro, North Carolina recently. During her final attempt in the long jump, Hall jumped 22'5", breaking the national high school record of 22'3" inches that was set 39 years ago. That mark also broke the junior national record set by Carol Lewis, sister of nine-time Olympic gold medalist Carl Lewis. Hall also competes in both the 100 and 200, and finished third in the 100 with a time of 11.37 seconds, which is the fastest ever by a Maine woman. That time is 0.04 away from the qualifying standard for the U.S. national championships. Hall is appreciative of the support of her parents who along with her older brother and an adopted 4-year-old brother who are there to cheer her on at every event. She is “crazy” motivated everyday about this sport which she started competing in eight years ago. At first it was hard to decide on her favorite event, eventually choosing the long jump to concentrate on, knowing she could do something with this. In her off time Kate enjoys playing the piano and spending time with her family. Her history-making jump puts her in a tie for ninth place in this year’s world rankings and tied for third among U.S. women along with Brittney Reese, the 2012 Olympic gold medalist and 5-time world champion. Halls best outdoor mark going into the meet was 20’11” at the New England High School Championships where she jumped 20’ 11 ¼” to win the high school indoor national championship. “I skipped an entire foot. I was thinking tonight how years ago when I first went to nationals I saw people breaking national records. I never thought that it would be me,” said Hall. Hall with be attending Iowa State this fall on a full athletic scholarship where she plans to study Kinesiology (exercise science). Hall, who was home-schooled, was coached throughout high school by a South Portland trainer, Chris Pribish, who owns The Medically Oriented Gym. She ends her high school career with six New England titles, four New England records and two national meet records. Throughout her high school career, Hall has continually raised the bar on her goals and performances and she has done this as a Type 1 diabetic with celiac disease, which means on a normal day she must check her blood-sugar levels five times, but during competition she might check it that many times in a few hours. She said this jump was far beyond her expectations. “This is crazy to think I’m ninth in the world as a high school senior,” Hall said. If you would like to stop and congratulate Kate, drop by the Ice Cream Dugout in Windham and visit her where she is currently working before attending college this fall. It was a beautiful day last Saturday to be on the greens at Point Sebago in Casco, where 25 teams of both men and women played a game of golf and enjoyed a barbeque while soaking in the sun, all to support a local fundraiser. This is the fourth year in row that Windham athletic director Rich Drummond has put together this tournament for the district. The tournament celebrates the athletic department in RSU14. Drummond wanted to start the tournament as a culminating event after a school year. It's also a nice community event that has received great feedback. Financially, it has helped provide extra items needed for the athletic department. The profits that are raised are to help support the athletic department anywhere it is needed. This year’s proceeds will fund a junior varsity golf coach and a first team field hockey coach. In years past as many as 32 teams have participated (36 teams is considered a full field), it has always had a great turn out. Local people and businesses have helped to sponsor the tournament in many ways. Some businesses donate monies towards the event while others help with prize donations that are then raffled off. These prizes range from apparel with Windham Eagle embroidered on them, Nike apparel, framed sports photography, sporting event tickets, and trophies to take home. Teams that come back year after year and new participants in this event, all look forward to a day of golf, sharing some laughs, enjoying bantering conversation with other teams, and making new acquaintances. This year’s events brought about a team that included Boston Celtic legend Dave Cowen who has retired to our local area. Everyone including Cowen is just out to enjoy the day, enjoy the great game of golf all for a good cause.